You know the score, buy a brand new PC and within a few months it's slowed, the hard drive is full and you're seeing error warnings generated by software which hasn't been fully uninstalled. The secret is to find a mainenance tool which you can run regularly and keep your PC in working order. 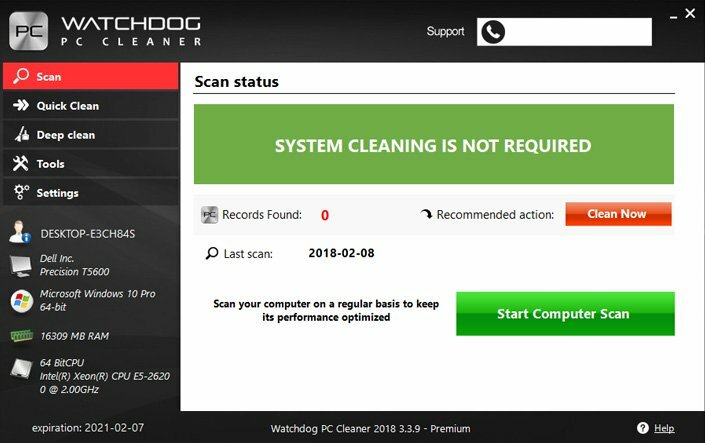 Watchdog PC Cleaner 2018 is one such tool. When you first start the application, it immediately goes to work (even if you don't request it to) checking your PC for common errors by running a Quick Clean. This will scan your Registry for errors, check for temporary files clogging your drive, old caches which might be full and junk files which are no longer required. If you want a far deeper system analysis, there's always the Deep Clean option, which will check against individual applications and enable you to remove unnecesary data. Want more control? PC Cleaner 2018 also gives you a Startup controller, so you can quickly turn off individual applications starting with your PC. You can also scan for duplicate files and remove if necessary. You can setup an exclusion list of files or folders you want to avoid scanning, schedule a weekly scan and much more. This promo has expired. Please check back soon for new offers. Simply login (create an account if you haven't done previously) and click the "get serial code" button. You should be allocated a code immediately. However, this is a REDEEM code. You need to then use this code to get a proper licence code from https://registerwatchdog.com.